Let’s not wait any longer for this to become a federal holiday. Whether you are an employee or employer, you can make a difference. Voting in general elections is the most important action our citizens can take. But long lines, hours of waiting, transportation to the polls and office pressures make voting difficult for many. Do you have Election Day off? Do you give Election Day off? It's not too late to change your mind. 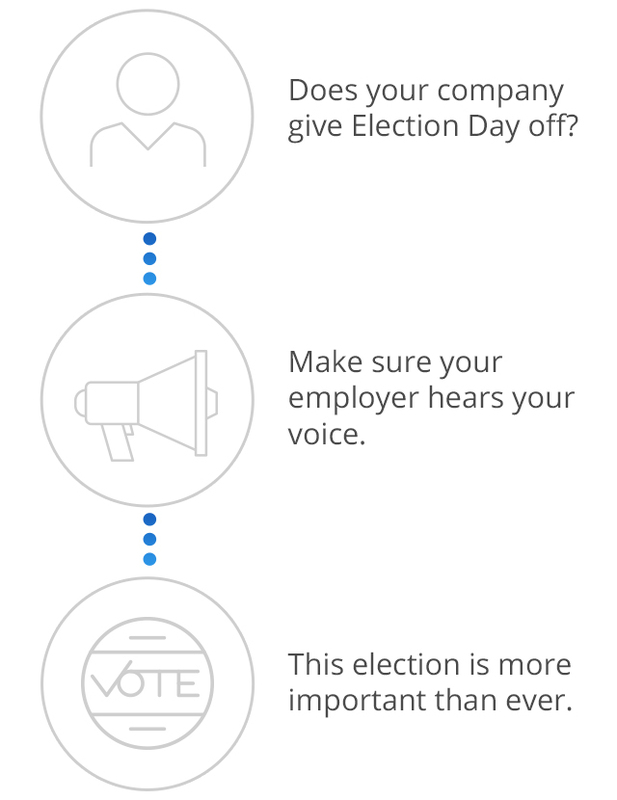 By giving your employees the day off from work so they can vote, you are helping preserve our Democracy and all that countless generations before ours have fought for. Wonderful! Would you like to give us your company's information? Would you like us to reach out to your company and get some answers? No worries. All communications will be sent anonymously from DemocracyDay.Us. Help us spread the word and convince more companies to give their employees the day off from work. What's the company's Twitter handle? I don't want to add a Twitter handle! This is the correct account!